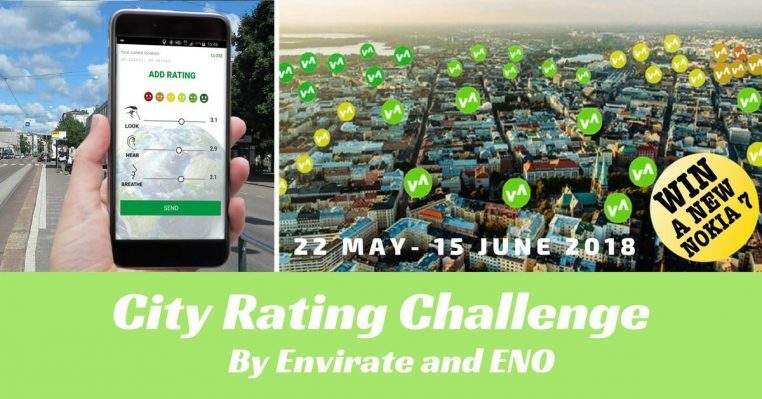 Campaigns, NewsComments Off on The global City Rating Challenge – Rate your environment and win a Nokia 7 Plus smartphone! The global City Rating Challenge is a competition for everyone who cares about our planet and wants to increase environmental awareness. Our aim is global data collection on quality of the local environment from people’s own perceptions. By rating you will create dots that will start to draw a worldwide map of the state of our planet. We will reward the 5 people who rate the most in their cities during 22 May – 15 June 2018 with the latest Nokia 7 Plus smartphones. Go to m.envirate.net with your mobile and start rating! The idea is to rate your environment with the Envirate app on a scale from 0 (very bad) to 5 (excellent) on three main senses – Look, Hear, Breathe. We’ll announce the leaderboard along the way on the Envirate and ENO Facebook pages so please follow them! NB! Please note that in this competition the quality of the ratings is the main priority. Therefore, we will carefully monitor the data quality, disqualifying all dubious users.